Happy hump day y'all! We are about half way through the week, and here's hoping we make it! I'm looking forward to a leisurely weekend, just need to make it there. Do you ever feel that way, like you just can't catch up? The more life goes on, the more I feel that way. Slowing down is definitely something I need to work on! But in the meantime, I'm excited to share more of Seattle with you. Seattle is definitely a place that surprised me! I wasn't quite expecting to love this city so much, but I really think the amazing weather we experienced was a big help. There are some wonderful sights to see here, and having great weather is always the icing on the cake! Today, I want to share our visit to Pioneer Square. We actually walked to Pioneer Square from The Great Wheel, a some 2 mile walk, uphill. #whoops But the journey was worth it! We passed beautiful buildings covered in ivies and dreamy city streets. Then once we reached the square, we were greeted by totem poles, a stunning iron pergola, cobblestone streets, and amazing architecture! While there, we decided to take a tour of the Underground, which we are glad we did! But more on that later. 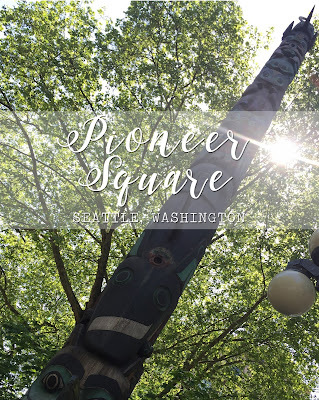 The square is a popular spot for peddlers and the homeless, so be prepared for that. I never felt uncomfortable, nor were we approached, but it's something I don't want to leave out. Give if you feel the desire, but just be aware of your surroundings. The stunning pergola, which I didn't get a full photo of, was built in 1909, and made of ornate iron. Along with the totem pole in Pioneer Square, the pergola is a National History Landmark. At the beginning of our tour of the Underground, we learned that the totem pole has its own sordid past consisting of a few drunk businessman. According to our tour guide, in the late 1800s while visiting Alaska, members of the Seattle Chamber of Commerce got drunk, and stole the totem pole. They brought it back to Seattle, erecting it in Pioneer Square. In the 1930's, the pole was set on fire by vandals. The city requested the original tribe replicate another totem pole to replace the lost one. The tribe was smart, and charged the city for both! Quite smart I'd say! Anyway, I hope you enjoy the photos of this fun stop, and add it to your own Seattle Itinerary. Have a great day!